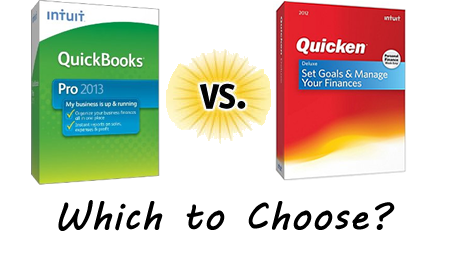 So what’s the difference between the 2013 versions of QuickBooks and Quicken? Simply put, QuickBooks is designed to run a business and Quicken to manage personal finance. There is a clear division between the two products and both exploit their strengths accordingly. The choice between the two depends on your goals and necessities. Although both products fall under the umbrella of financial software, they do not compete directly and provide expertise in distinct areas. QuickBooks 2013 is much more sophisticated in its accounting capabilities. It allows you to prepare quotes, invoices, receive payments, create payroll, or track inventory. Additionally it has over a hundred of different reports many of which are customizable. Some of those reports let you analyze balance sheet, income statement, or cash flow for better understanding of your company performance. With QuickBooks you can collect sales, personal and social security taxes and make deposits to the appropriate government agencies. Different versions offer specific features geared towards individuals in construction, manufacturing, nonprofit, professional services, or retail business. It also has a separate section to manage customers, vendors, and leads. As your business grows it is important to manage information. The software lets several users (number depends on a version) to access it and make changes. That allows everybody to be on the same page when it comes to accounts receivables, payables, pending orders, or goods expected to arrive. Communication with clients and vendors can be done directly from QuickBooks as it is integrated with Yahoo, Gmail, and Hotmail accounts. Quicken’s main goal is to help you better organize and manage your money. Regardless of that, Home & Business 2013 lets you include your small business and personal finances together for a better overall picture of your personal finances. There are limitations to what the software can do on the business side. If you run a small business or a side family business, Quicken would be an appropriate choice to record your activities letting you prepare quotes and invoices, prepare income statement, or search for deductible expenses; it also helps prepare Schedule C for you. Depending on a version, Quicken combines all forms of your personal finances in one place. Whether it’s different bank accounts, credit cards, it combines all forms of inflows and outflows of money. You can also track your investments, search for personal and business deductions, and create a list of business deductible expenses. There is even a solution for individuals who own rental property that helps organize details such as rental/lease terms, rents paid vs. outstanding, security deposits, income and expenses by property, or details necessary to prepare Schedule E.
The product is also very helpful in designing personalized savings and debt reduction plans. It lets you compare outcomes under different scenarios, i.e. change payoff/savings amounts and date by which you want to reach specific objectives. It is very easy to use and manipulation can be made by entering specific amounts or using a slider to arrive at the desired solution. The same feature can be applied to plan your retirement. Quicken is much simpler to use and very straight forward. After all, personal finances are simpler than those of a company. It is expected that you can operate it seamlessly after the initial set up. QuickBooks on the other side has too many features to master them in a day or two. It has a very intuitive interface that makes the learning process palatable and provides robust help center and access to community of users where you can find answers to many general as well as personal questions.